Do you need a math activity for comparing numbers that is common core aligned? This valentine trolls themed activity could be just what you are looking for. 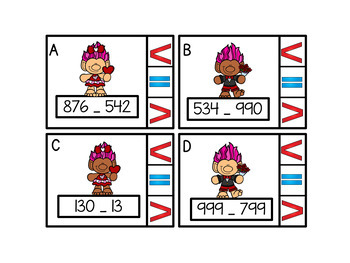 The student decides if the first number on the card is greater than, less than, or equal to the second number on the card. Then he clips a clothespin on the sign that goes between the two numbers. Students may cover the answer with a small manipulative such as a mini eraser. To make the activity self checking, put a small sticker or draw a star behind the correct answer. 24 color task cards in color. The same 24 task cards in black and white. Directions sign with standards included in color and black and white. Directions sign without standards in color and black and white. 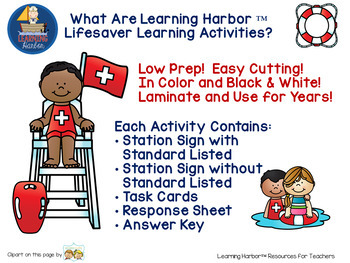 This is a Learning Harbor Lifesaver Activity. Prep. is super quick, and easy. All cutting is on straight lines. 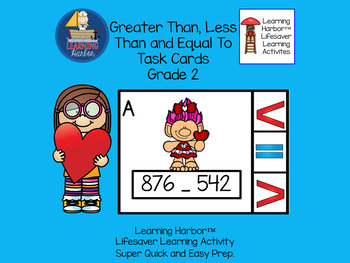 If you laminate the cards you can use this activity for years to come. Exit tickets - Students tell you the answer as they line up.